Marple Locks on the Peak Forest Canal will remain closed for a further week. 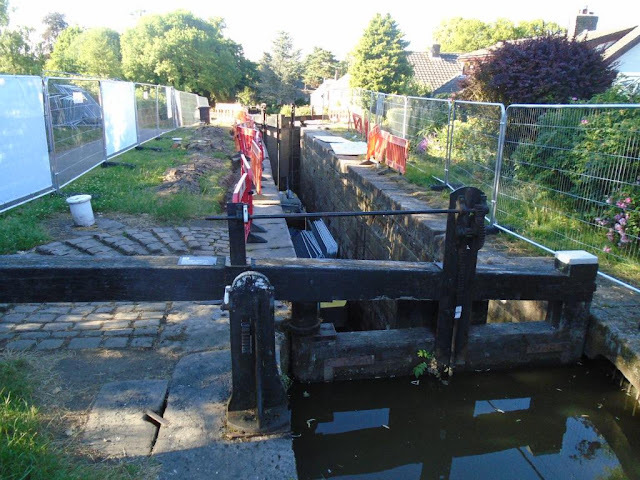 During the week from 25th to 29th June, CRT have been jacking stones outwards at Lock 11 of the Marple lock flight, where movement had caused to lock to become too narrow. A large number of the stones have been successfully moved and are now at 6ft 11in, the minimum required to allow 6’10’’ boats to pass through the lock. However, some stones have not moved back enough to allow sufficient clearance, so it has been decided that some masonry should be planed to achieve the require width within the lock. This will be carried out next week, starting 2nd July. The stoppage will be reassessed at the end of next week. Message from CRT: "The works to jack back the chamber wall at Marple Lock 11 have been completed. Unfortunately our monitoring has shown that the chamber wall moved (very slightly) overnight, so we want to continue monitoring over the weekend and into next week to ensure that it is safe, before we can re-open the lock to navigation (restricted to 6’10”)." Lock 11 has been deemed safe to operate for boats up to 6’10” wide under assisted passage from 12th July. There will be assisted passage through this lock between 9.00 and 10.00 am on Thursday 12th July, then only between 3.00 and 4.00 pm each day. Further movement of the lock walls of Lock 11 have taken place and the lock flight has now been CLOSED until the lock walls can be rebuilt, which is likely to take a number of months. The locks would have had to be closed from August 13th anyway due to water shortage.